What results can we expect when we work with you to design our natural playspace? First, you can expect a great design—a space that really works for children (and adults), that looks beautiful and that makes your little corner of the earth greener and healthier. You can expect children (and teachers) who LOVE to come to school or to go outside. Kids who are sick less often, who get along better, who play and think more creatively AND who score higher on standardized tests. You can also expect your enrollment to increase because your unique and inviting outdoor space will bring families who want the best for their children flocking to your school. I’ve heard that you are an expert in designing spaces for children. How long have you been doing this and how did you become an expert? I’ve been designing spaces for children for more than 30 years. The thing that makes me unique is that I began my career as a preschool teacher, so I understand the concerns of teachers. I understand that spaces—whether indoors or out– need to be engaging and inviting, comfortable and efficient. When spaces are designed that way, teachers can provide the best for children. For the past decade I’ve focused exclusively on creating outdoor spaces that really draw people outdoors because I know how vital it is– especially for children– to take a break from the screens and connect with nature. I earned my master’s in Sustainable Landscape Design from George Washington University, which gave me a passion for native plants and a lot of knowledge about sustainable landscape materials and techniques. I have an undergraduate degree in early childhood education from Wheelock College, so I have a solid background in child development, and I studied children’s design at The College of Design at North Carolina State University and Harvard Graduate School of Design. My clients are schools, parks, early childhood programs, families and other designers– who don’t want a cookie cutter approach to designing outdoor space. Unfortunately many of them have seen or experienced “playgrounds” that consist of a piece of manufactured equipment in a sea of mulch surrounded by a chain link fence. They understand that those spaces aren’t good for people of any age. My clients want their outdoor space to be lush and green and as special as the rest of their outstanding program. Some of the clients I work with have existing outdoor spaces that need to be enhanced. They may have mature trees to protect, traditions to honor and elements they want to keep. Others have brand new spaces where they get to start from scratch. Architects and property developers who want to include nature play in their projects. What kind of clients do you work best with? My best clients are those who are ruthlessly committed to providing the best for children and understand the importance of getting kids outside. My best clients are set up and committed to do their part. They schedule the time, they participate, they provide feedback, and they follow through on their obligations in the contract. My best clients are the ones who are ready to dive in and get results for their kids. What kind of clients do you NOT work well with? Organizations have to have clear project leadership and communication. It’s easy, especially when lots of people are involved, for things to get confusing if it isn’t clear who’s in charge. My process helps to guide you in establishing the systems that are essential for success. With schools I have found that it is essential for the head of the school to be supportive. That person sets the tone and makes outdoor learning a part of culture so it is incorporated into the curriculum. If the head of school doesn’t get on board, in my experience the program just won’t be sustainable. I thought creating a playground meant just choosing equipment out of a catalog. Why is a natural playground better? Nature is always growing and changing, unlike static equipment, so there is more to observe and more to learn. Nature nurtures and soothes and reduces stress. Natural, hands-on spaces offer children more opportunities to change their environment, and thus to be engineers, builders, artists and creative problem solvers. Natural playgrounds are made of real stuff—not just metal and plastic—so children learn authentic lessons with all their senses. I happen to believe that kids don’t discover as much about the world when the ground is covered with rubber and the rocks are made of fiberglass. What will the process of working with you be like? I firmly believe that good communication is key to success, and my process is set up to guarantee that that happens—in many different ways. When I’m working with an organization there are often lots of people who need to be involved and it is vital that I understand who they are. We will begin with a free phone consultation. I will explain my process in more detail on this call, and you will tell me about your project. After that, when we walk the site together and talk face to face for the first time, I will ask you to fill out a checklist that will help us to get clear on how we communicate and with whom. Next I’ll prepare a customized proposal that outlines the unique details of your project, the steps we’ll follow and the pricing. Once the contract is signed, you’ll need to provide me with a site plan (I’ll explain more about that when we talk) and I’ll return to your site and do a thorough site analysis. The next step is often a participatory design workshop called a Charette. A Charette can bring a community together and generate a lot of excitement. The Charette is your opportunity, as a neighborhood, or as a school community of teachers, parents and administrators to teach me about your space so I can see it through your eyes. I’ll also share some great techniques for eliciting ideas from the children, and involving them right from the start. After that I take all the dreams and cool ideas you’ve shared, and I turn them into a design that captures your vision. We’ll have a presentation midway through the process so you have opportunities to respond to the design and be sure I’m going in the right direction with it. The Master Plan is a gorgeous, color rendered drawing (with lots of descriptive text) that your community can see and understand, and that will inspire them to get on board and help. The design will clearly and compellingly communicate your plan to funders—whether that is grandparents, a foundation, a corporate sponsor or the local school board. Next my team and I will create the construction documents, planting plans, permitting plans etc. that you need, along with pricing and planning for construction. Finally we build it—and as I describe below, there are a variety of ways to get it built, but I am available to be there through every step of the process to ensure that you get exactly the space you’re dreaming of! If we use manufactured equipment we know it’s been tested for safety. Are natural playspaces dangerous for children? I’d like to start by telling you about a fascinating study that shows that kids who climb trees are less likely to have accidents than kids who climb on manufactured equipment. The reason is interesting. It’s because unlike standardized manufactured climbers, tree branches vary in diameter and spacing, so kids are more likely to pay attention. And when kids are paying attention and can understand and choose the risks they’re ready to take, they are safer. AND they’re learning important lessons about making good choices. But rest assured, whether you choose manufactured or natural climbing, you can be confident that we are scrupulously careful about designing to prevent hazards. We use safety surfacing – like sand or mulch– and follow CPSC Playground safety guidelines. We want to be sure children get the physical activity they need. Do natural playspaces offer enough movement opportunities? Some of our clients prefer hybrid playgrounds that combine natural and manufactured elements. Things like pedaling, hanging, swinging, and sliding happen more easily when we add some manufactured elements. We can help you with either type. Our parents don’t like their children to be dirty when they go home. How should we deal with this? The schools that have dealt with this the best are the ones that make it part of parent education from the beginning. It is important for you to be clear that you are a school that values rich outdoor experiences. You should say it everywhere -in your enrollment information, in your newsletter, at parent meetings and in your daily conversations with parents. And then ensure that all kids have a change of clothes, and the right clothes for the weather—rainsuits and boots for muddy days, hats and mittens in winter, etc. Parents whose schools have added great outdoor programs tell us that their kids have more to tell them about their day (and are more tired) when they come home! How can we as a organization with so many competing needs find ways to afford this? Know that many organizations I’ve worked with to create great outdoor spaces have initially struggled with this issue. My clients have come up with all sorts of creative ways to provide this essential program component for their children. Some fundraise in unique ways like home & garden tours, musical performances, and things like “buy a brick” campaigns. Some find private donors –starting with friends and families– it is amazing what people give when asked. Some create online “crowdsourcing” campaigns. Some get grants from foundations and corporations. Some have access to government funds—federal, state or local. And still others build it into their capital improvement budget. There are lots of ways to make it happen (check out my blog post on funding), but let me tell you, once they decide to go forward and have a compelling, inspiring Master Plan, things start to happen and momentum builds in ways that often surprise my clients. I believe that an investment in outdoor learning, natural play and landscaping will, dollar for dollar, get you much more play and learning value than manufactured equipment. Check out my blog post on funding for more ideas. One of the parents said they could create a design for us for free. What makes you different? You can probably find a student or a volunteer who would be happy to create some kind of a design. What YOU need to find out is whether he or she understands the complexities of designing a space that is environmentally sustainable AND educationally sound. Yes, volunteers are vital, but in a role like this, using a volunteer may cost more in the end. You need to be sure the person who designs your space will take the time to understand your school’s unique philosophy, and will design a space that works—not just pretty to look at, but that fundamentally supports teachers and children and the work they do each day. How can I justify the expense of hiring a designer? You wouldn’t expect to build a building without an architect, or a bridge without an engineer. Hiring EarlySpace to design your playspace means that there is a plan and it’s been done by an expert. You’ll know someone has thought through details, large and small. We think about where the outdoor art supplies will be stored, what materials are needed to build the mosaic stream and how to zone the space so kids who want to read quietly won’t be hit by a ball. You’ll know your edible garden will get enough sun and what kind of plants attract butterflies and songbirds. You’ll be sure the amphitheater is big enough to seat a class and that water will drain out of the sandbox. You’ll know that the space is in compliance with playground safety guidelines, and that our engineer is on top of the permitting requirements. In short, it’s the difference between a space that works and a space that might just be very frustrating. I’m local. What added benefits do you provide for clients who are local? There are four key reasons why choosing me over a designer from outside the area will lead to more support and a more seamless design for you and your program. First, I am nearby. I can be available through every phase of design and construction. We can have face-to-face meetings throughout the process. meet with regulators, inspectors and licensers. Second, I am experienced with local regulations. My understanding of our Chesapeake Bay watershed and the requirements related to caring for the Bay helps me to guide you through the process and know what to expect in a way that a designer from outside our area will not be able to do. Third, my familiarity with the plants that grow here allows me to provide a complete and integrated design to my Mid-Atlantic and East coast clients. Great plants are absolutely fundamental to the spaces I create, but surprisingly, many playspace designers don’t even provide a planting plan. 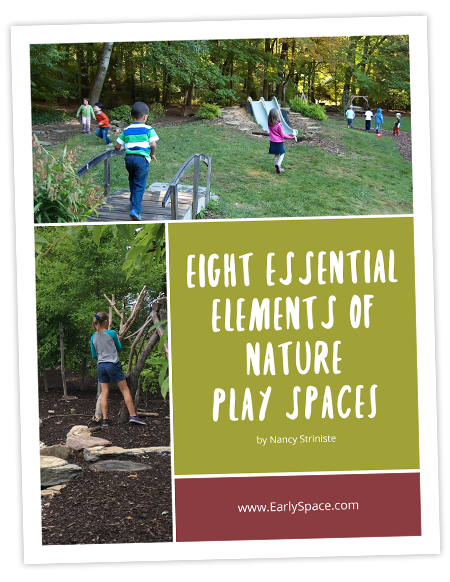 My understanding of all aspects of the design allows me to choose native plants and then to place them thoughtfully so that they compliment the adjacent play and learning settings and offer curriculum and play value. And fourth– I can provide experienced, reliable, local contractors who I know and trust. That is worth a lot. Clients who have looked at both options and chosen me say that working with me was a HUGE benefit. How do we get it built once you design it? EarlySpace’s authorized contractors can do a turnkey installation so your space will be completed beautifully. And I will be there to oversee, which gives you the piece of mind of knowing it will be done according to plan, and any unforeseen problems and questions will be dealt with appropriately. Another option is to use my authorized contractors for portions of the installation and have volunteer workdays to build the rest. This will save money and build a sense of community. My team and I are available to lead your volunteers in workdays that will be awesome–fun, productive and educational. If your organization or jurisdiction requires that you get multiple bids on installation, know that your design costs will be higher in order to prepare the necessary drawings but my team is experienced and available to produce these when needed. It sounds like this might require a lot of maintenance. Does it? Great question! As you probably know, there is no such thing as a maintenance-free space. EarlySpace provides a customized maintenance plan – a chart that lists every element in your space and what it will need weekly, yearly or whatever—so you can plan ahead. Unlike manufactured play equipment that requires expensive specialty parts—a natural playspace usually needs only things like simple mulch and garden care. The tasks will be different but manageable. If your maintenance people will be doing the care, they should be involved from the beginning. I always encourage clients to invite the custodians and facilities people to the charette. Time and time again that has inspired lovely and unexpected contributions. I also see schools coming up with all sorts of fun ways to involve others. From “First Friday” — a monthly pizza night on the playground when families play, socialize and maintain the space—to a collection of child-sized brooms that make keeping sand in place a fun activity for kids. When you create a space that people–students, parents, teachers, custodians, and community–are invested in and love, they will be much more likely to help care for it. How long will a natural playspace last? Some natural materials last longer than manufactured equipment, like stone; others, like stumps, break down over time. I think decomposition is part of the learning that is possible in a natural schoolyard so I view this as an opportunity for your children to witness natural processes (and meet science curriculum goals). While stumps and mulch may need to be replaced more often than metal play equipment, they are inexpensive and widely available. I understand you charge a consultation fee. Why? I know how valuable my client’s time is. I also know how valuable my time is. The consultation fee is required in order to honor the time and energy of everyone involved in the initial consultation. This meeting includes a walkthrough of your space and a detailed conversation about your school and what you envision your project to be. I will explain the design and construction process in great detail. In a way, this first meeting is like attending a workshop, but one that is focused only on what matters to you and your school. After the meeting, I will create a highly detailed and customized proposal that describes every step of the process as well as the scope of work we have agreed upon. The value that you get out of our meeting and the proposal is huge. The information that I give you ensures that you understand not just what will work best as a process to get you to the space of your dreams, but the value of each step to your school community. The vast majority of the time, the people who met with me for an initial consultation become loyal clients and their fee is applied towards the cost of the design. The initial consultation fee is to walk your site, discuss your program and prepare a customized design proposal. If you decide to work with EarlySpace, the initial consultation fee is applied to the cost of your design. If you decide not to proceed, no further amount other than the fee is payable (unless you have contracted for additional services). I’m still not sure. What should I do if I still have a few questions? Committing to build a natural play or learning space is a big decision and I appreciate that.